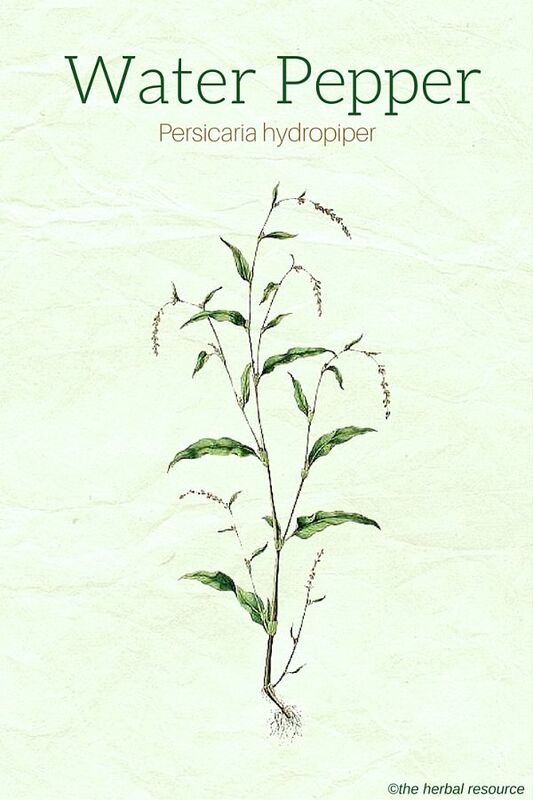 Botanical Name: Persicaria hydropiper, Polygonum hydropiper . Other Common Names: Smartweed, water smartweed, biting knotweed, marsh pepper, knotweed, biting pepper, sickleweed, bog ginger, Wasserpfeffer (German), renouée poivre d’eau (French), pimienta del agua (Spanish), brennibaðka (Icelandic), bidende pileurt (Danish), katkeratatar (Finnish), vasspepper (Norwegian), bitterpilört (Swedish). Habitat: Water pepper is native to the entire northern hemisphere (Europe, Asia, and North America). 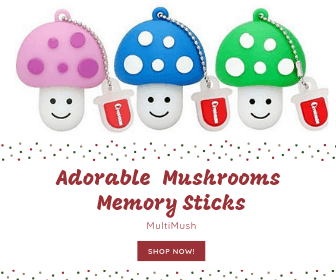 The plant grows in muddy and damp areas, ditches, flooded river banks and in damp forests. The plant can also occur as a weed in poorly drained farmlands. 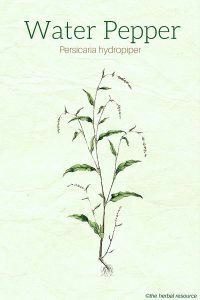 Plant Description: Water pepper is an annual plant and a member of the knotweed or buckwheat Family (Polygonaceae). It can grow up 30-50 cm tall with branched stems. The leaves are dark green, ovate to lanceolate with corrugated edges and glands on the underside. The leaves are usually 10 cm long, broadest below the middle. The white to light pink flowers are inconspicuous and appear from July to September. The fruit is a flattened and triangular, dull dark brown nut. Plant Parts Used: The whole aerial part of the plant can be used in herbal medicine. The plant is mostly harvested from the wild during the flowering period and dried in shade at temperatures not exceeding 40 ° C.
The plant is odorless but has a bitter peppery taste. When water pepper is dried its active substances decrease significantly, therefore the herb should preferably be used fresh if it is intended as a medicinal herb or spice. Active Ingredients and Substances: Water pepper’s main active constituents are flavonoids (quercetin, kaempferol, hyperosid, isorhamnetin, rhamnazin), coumarins and tannins (mainly hydrolysable tannins). In addition, the plant contains minerals, vitamins A, C and K, bitter substances, rutin, organic acids and essential oils. The sharp peppery flavor is due to the substance polygodial. Water pepper became known early on for its poignant, peppery taste and has been used as a spice and medicine since ancient times. As an herbal medicine, it was considered an effective cure for a variety of ailments, including a toothache, epilepsy, gangrene, rheumatism, and gout. Pedanius Dioscorides (1st century AD) and Galen of Pergamon (131-201 AD) recommended the herb as a laxative, while Paracelsus (1490-1541), a Swiss-German philosopher, physician, and botanist, believed it had styptic properties and that it could also be used as a remedy for upset stomach and jaundice. Nicholas Culpeper (1616 – 1654), an English botanist, herbalist, and physician, included the herb in his writings and stated that water pepper juice could be used to get rid of worms in the ear canal. Probably at that time ear parasites were more common than they are today. Culpeper also wrote that if water pepper was placed under a horse’s saddle, the horse would not feel hungry or thirsty during long rides. People used to scatter pieces of the plant on floors of their homes to get rid of fleas and keep flies at bay. In most of Scandinavia, the herb was used fresh in folk medicine for stomatitis (inflamed and sore mouth), gout and as a toothache remedy where the herb was either placed directly on the affected tooth or teeth or it was used in the form of a strong decoction which was then used to rinse the mouth. The dried and powdered herb was also used to treat minor wounds and cuts and it was used fresh as a remedy for scurvy due to the herb’s high content of vitamin C.
In today’s herbal medicine, water pepper is mainly used as a topical astringent agent and a remedy against diarrhea. The tannins, bitter substances, essential oil, glycosides, organic acids and vitamin C (only present in the fresh plant) are considered to be the most important medicinal substances in water pepper. These substances give the herb its astringent, styptic, diuretic and anti-inflammatory properties. The leaves also contain the substance rutin, which is thought to strengthen fragile capillaries and thereby prevent bleeding. 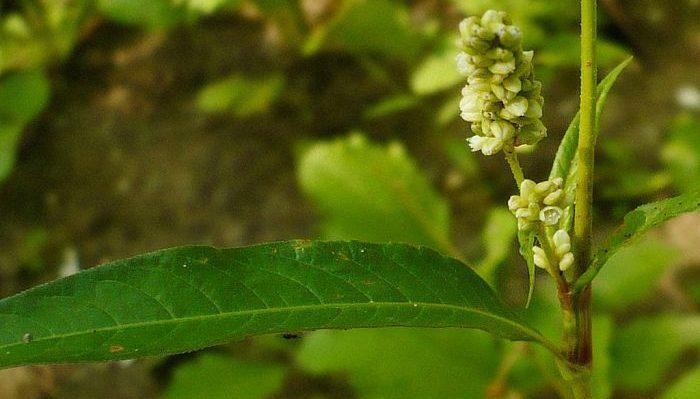 Water pepper can also be used internally as a tea against heavy menstrual bleeding, bleeding after childbirth, vaginal bleeding between periods and minor bleeding in the digestive tract caused by hemorrhoids. In addition, the herb (in tea form) is sometimes used by herbalists as a digestive tonic and a remedy for diseases and ailments of the digestive system such as dyspepsia, diarrhea, dysentery, colic and intestinal worms. Since the tannins present in the herb act astringent and anti-inflammatory, it can be used externally to treat hemorrhoids, minor cuts, bruises, bleeding and slow healing and infected wounds. Extracts or decoction of water pepper can be used as an astringent agent to close open pores and tone the skin. When the herb is added to bath water it is thought to have both invigorating and sedative effect. Water pepper has a sharp, strong flavor, and both the seeds and leaves have been used as a substitute for pepper. The seeds are small and are rather problematic to use when they are intended for pepper replacement, but they can be allowed to germinate and the small seedlings can then be added to salads or used as a garnish. Water pepper’s flavor is so strong that it almost numbs the tongue, not unlike horseradish (Armoracia rusticana) or wasabi. The plant has not been used much for seasoning in Europe or America but in Japan, the fresh leaves, sprouted seeds, and seedlings are often used as a flavoring in soups and salads and as a garnish for dishes like sushi. When the leaves are either dried or boiled they lose most of the strong peppery flavor, so when used in cooking it is best to use the leaves fresh or add them just before serving. Information on the dosages and doses of water pepper is lacking and when the herb is intended as herbal medicine it is best to contact a trained herbalist or a professional health care provider knowledgeable on medicinal herbs. As an extract: 30-40 drops before meals, 3-4 times a day. As an infusion: A third of a cup 3-4 times a day before meals. There are no reports of contraindications or side effects when the herb is used in small or moderated doses, but ingestion of a large amount of the herb has been known to cause irritation of the digestive system. The fresh plant sap can also cause skin irritation in some people. Before using the herb as a treatment for internal bleeding, the underlying cause of the bleeding should always be determined by a physician to rule out any serious illness. Pullaiah, T.: Encyclopedia of World Medicinal Plants. Vol I-V. New Dehli (India), Regency Publications 2006.